Took Mom to get a facial at Jenny's house. For those of you locals, Jenny is a friend of ours who gives the best facial ever - I highly recommend her services. I almost always fall asleep and wake up totally refreshed. John and I dropped Mom off for her appointment and then went off to spend an hour while Jenny worked her magic on Mom. We returned to a quite refreshed looking Gertrude. She just glows after a facial. Jeff came up toting a big zucchini I'd left in his car the day before - don't ask. We threw some burgers on the grill, potatos and onions too, and fresh broccoli. Another fun throw together evening at the Mansion East. John treated his parents to a trip East so he went off to collect them at the airport before returning to his house in West By-God Va. He, his parents, Mom and I are heading down to Victoria's house for a few days. 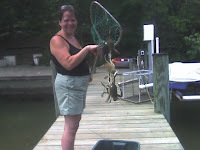 Vic is in South Carolina vacationing with her family but graciously gave us her house on the water down by Solomon's so we can spend a few days of recreation down at the Tiki Bar and catching those delicious crabs off her dock. Mom, as always, gets all the claws but not without a lot of grumbling from me. Jeff will be staying at the Mansion East with all 5 dogs - I believe we'll be having a better time than he will.